California Living ® visits Potter Schoolhouse made famous by Hitchcock’s Birds Movie. Join California Living ® host Aprilanne Hurley in Sonoma, California, for an insider’s guide to the filming sites of Alfred Hitchcock’s 1960’s thriller “The Birds”. Complete with Hitchcock filming insights and Birds movie trivia, Hitchcock fans and movie buffs are in for an entertaining first look at this California Living ® Travel Special now on-demand. Check out Potter Schoolhouse located in the small in-land town of Bodega, California – made famous by Hitchcock’s 1960’s thriller “The Birds”. Discover the location of Mitch’s ranch house from the movie “The Birds,” located in Bodega Head, California. Now the general location of the UC Davis Bodega Marine Laboratory. the public is invited to sign up for tours, classes and events. Visit the Tides Wharf & Restaurant – located on the water in Bodega Bay, California for a behind the scenes look at how their famous Clam Chowder is made. 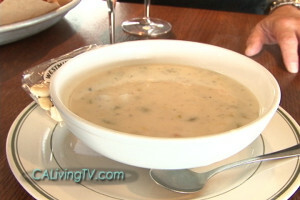 California Living ® scores The Tides Wharf & Restaurant’s famous Clam Chowder Recipe. Bodega Bay locals and visitors need look no further than the Tides Wharf & Restaurant to enjoy some of the best clam chowder on California’s coast. Sure there are plenty of restaurants competing every year to be named the “best,” yet, the Tides has been practicing perfection for quite some time now. So you can imagine how excited we were to go behind the scenes to see how the Tides Restaurant’s famous Clam Chowder is made. And the best part is, we even scored the Tides’ famous Clam Chowder Recipe to share with you. 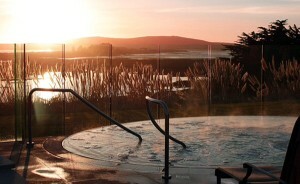 California Living® spotlights the Bodega Bay Lodge & Spa on the Sonoma Coast. California life is all about taking the time to explore fun getaways in our own backyard. With this in mind, California Living ® shares an inside look at where to “stay & play” in Bodega Bay, California. From white sandy beaches, to classic candy & kite stores, to wine tasting and gourmet cuisine, you’ll discover there’s something for everyone in Bodega Bay, California, on the Sonoma Coast. Whether you’re a “resident tourist,” or a visitor to the Golden State, California Living ® host Aprilanne Hurley recommends checking out Bodega Bay and the many other great California travel destinations and fun things to do – to make the most of…California life. #Sonoma, #Sonoma California, alfred hitchcock trivia, bird movie bodega bay, Birds Movie, birds movie triva, bodega bay lodge, Bodega Bay Lodge and Spa, California, California Life, California Living, California Living TV, California travel, filming locations of the birds movie, hithcock birds movie, sonoma coast landmarks, sonoma coast travel, sonoma county, sonoma county travel, The Birds, Tides Clam Chowder Recipe. Bookmark.